The storm has come and gone. Reports of hail and wind damage are on the news. The trees in the neighborhood appear to have been shredded as they litter leaves and debris in the streets and yards. You might see hail stones in the yard or in your gutter downspouts. Something significant happened and you are not sure if your house was damaged or not. Sometimes roof damage is easy to see. More often times however, a homeowner cannot tell if there is insurable damage. 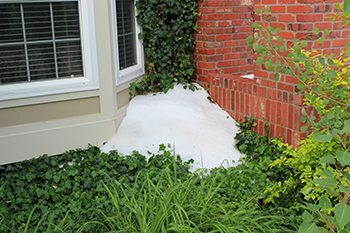 It usually takes a trained eye of an experienced inspector to identify hail or wind damage. “I think something happened with that storm”, you think to yourself. Your neighbors might be getting their roof replaced. Roofing companies are in the neighborhood. You’ve had roofing people come to your door. Flyers are coming in the mail or being hung on your door about hail damage in the area. All of these are signs that a recent storm caused damage to homes in your area. The following step by step process will show you how a roof inspection happens and what to expect. Often times a homeowner will crawl up a ladder and take look for themselves. Here is Jane precariously perched on her ladder. This can be dangerous. It is fine to take a peek but be careful climbing on your roof. Finding insurable damage can be difficult to notice. A complete inspection of all sides and angles of a roof are required for a complete analysis. You can see how a ladder could shift as the homeowner leans to check things out. And what is she looking for specifically? She isn’t really sure. Her next step is to call an expert. Put the ladder away and get someone here who knows what they are doing. Richardson Roofing is a local Northwest Arkansas Roofing company with BBB A+ Credentials, the highest certifications from the best manufacturers and hundreds of great reviews and thousands of satisfied homeowners. A roof inspection should be conducted by an experienced and certified roofing expert. A qualified roofing expert can identify hail stone impact, wind damage from lifted shingles and other issues that insurance companies will want to establish if they are to award a claim for roof replacement. A complete inspection will include looking at the shingles across the entire roof structure. Hail and wind can come at different angles – impacting one part of the roof and not the other. So a full and complete inspection is required. Gutters can also show signs of significant damage from hail stone impact. Gutters can also contain large accumulations of granules caused by hail impact or wind lifting and damaging shingles. As part of your roof inspection, the contractor should provide images of the damage they found. These images will be supporting information to help the insurance company make a decision on a claim, should you choose to submit one to your provider. Your contractor should provide you with a leave behind report detailing what the inspection discovered. If there is no damage, the report will let you know that on this particular date, your roof was in good condition. Hang on to the report. This will be your evidence for the future should another storm come through you can let your insurance provider know the damage is new. If damage is found on your roof, your contractor will detail where it is located, how many impacts they estimate and severity of the damage. After your roof inspection report is compiled, your contractor will explain how to read the report and what the significant findings were on your roof. If your roof qualifies as an insurable replacement, you will be able to choose from many new roofing options – including color, dimension and style. Your insurance coverage will usually only cover a similar replacement to the existing roof type. But a new color can make a huge difference in the curb appeal of your home. And manufacturers have come out with new shingles that give a greater depth and architectural appeal than from years past. When a storm hits or if you feel like a past storm may have done damage, it’s a simple process for you to find out. Call a recommended local roofing expert like Richardson Roofing to do the work and provide the report on your roof. This report will give you the assurance your roof is safe and secure.